Oh and you should all think about signing up for Mental Health Awareness Month! June is fast approaching now. Jen & April @ The Starry-Eyed Revue discussed their love/hate relationship with love triangles! Charnell @ Reviews from a Bookworm talked about blogger love! Go link up yourself and/or your favourite bloggers. Miranda @ Tempest Books discussed reasons why she might or might not want to follow your book blog. Cait & Mime @ Notebook Sisters are celebrating their 3-year blogoversary with a week-long Alice-in-Wonderland-themed party starting today! Frabjous day! 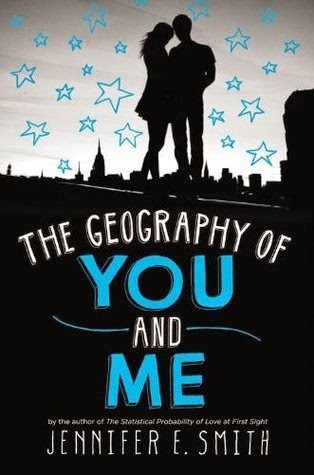 The Geography of You and Me by Jennifer E. Smith: Thanks Headline and Bookbridgr! I was looking for a light and fun read, so I decided to request this. I'm halfway through at the moment. I was initially charmed but am now finding it a slightly frustrating read. Don't know what my final verdict will be yet; stay tuned for my review! The Culling by Steven Dos Santos: Yay, the book I won in LGBT April is here! (Thanks Cayce and Laura!) I hope this is good. I've seen some reviews say it's a lot like The Hunger Games and some say it's nothing like The Hunger Games... Hmm. 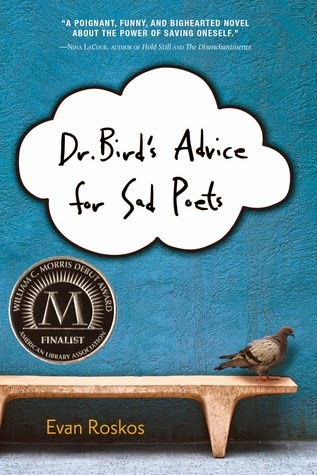 Dr Bird's Advice for Sad Poets by Evan Roskos: Bought this for Mental Health Awareness Month! It's about a boy who suffers from depression and anxiety, and he really likes Walt Whitman. And he talks to an imaginary bird as his therapist. It sounds so interesting! 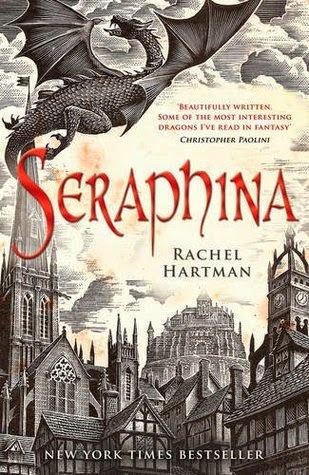 Seraphina by Rachel Hartman: Remember how World of Books sent me a proof copy of Tribute by Ellen Renner by accident? I sent them an e-mail and they said they'd send me another book for free, so I picked this. This sounds like a really amazing fantasy novel and a fresh take on dragons! Anna and the French Kiss by Stephanie Perkins: Okay, I don't know when I'm ever actually gonna read this but it was free on iBooks so I got it. It just doesn't really sound like my type of book? But the next time I'm looking for something really cute and light I'll try this. 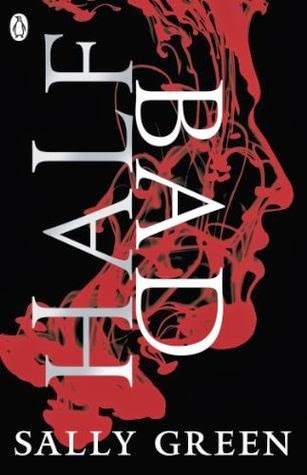 Half Bad by Sally Green: Kindle edition was only 79p so I couldn't resist. I would never have been interested in this book if not for the hype. Nothing about it stands out to me; I don't really like the cover, and the blurb is a bit meh. But oh, the hype! Please be good, book! Nice haul this week, looks like you have some interesting reads. Sharon - My Sunday Post. Did I ever tell you I love your little jellyfishes ? Nice haul, have a great week ! I am curious about the Gentle Wounds and thanks for sharing those links:) Have a lovely weekend! The Geography of You and Me sounds awesome! Have just requested it myself. The Culling is absolutely amazing! So violent, and really thought provoking! I loved it! Really want to read The Sowing! I'm also taking part in MHAM, but I've not heard of either of those books. They sound interesting though, I look forward to your reviews! You got Anna and the French Kiss!! Yay~ And yes, Mental Health Awareness Month. I'm seriously considering signing up. I did get The Shock After the Fall yesterday in Waterstones - my daughter actually pointed it out - and finally signed up for MH awareness month. 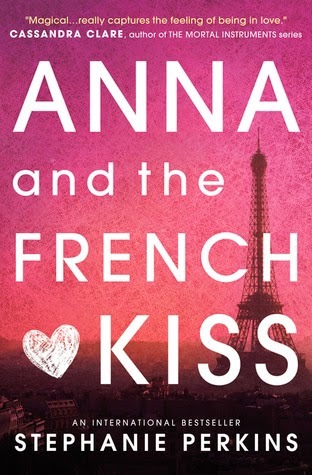 I avoided Anna and the French Kiss for a long time because it didn't seem like my type of book either. But then I read it and really enjoyed it - and it actually got me reading other contemporaries too. So, now I have a new genre to love. Yay! I certainly hope so too! (: It looks so good! SO MANY GOOD REVIEWS ON GOODREADS. Ahhh I can't wait. Oooh, I hope you enjoy The Shock of the Fall! I'd love to hear what you think of it. Glad to hear you signed up for MHAM! It sounds like it's gonna be a great month. Ugh, I'm a silly sappy person and I have to admit I really enjoyed the end of The Geography (even though yes, it was supremely predictable), but the middle 90% was just... God. They're such idiots WHY WON'T THEY JUST TALK TO EACH OTHER. Haha, yes. I really should read Battle Royale but argh nightmare fuel in manga form is literally the most terrifying thing to me for some reason. Hmm, I hope I like The Culling too! I enjoyed THG a lot when I first read it, so The Culling will have a lot to live up to. Yay, glad to hear you loved The Culling! I'm really hoping I like it too. Yeah, I heard about MHAM through your blog! 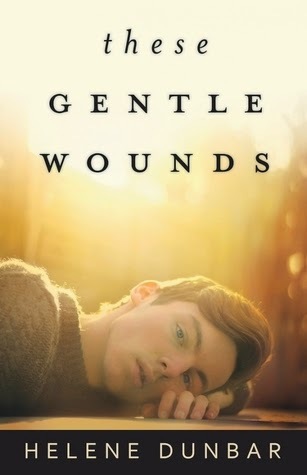 (: I found Dr Bird's Advice by browsing through the Goodreads shelf that Leah made for MHAM, and I think I heard about These Gentle Wounds on Twitter since it's a book that came out very recently. Thanks for stopping by! (: Yeah, These Gentle Wounds looks really interesting! I'm looking forward to reading it. Thanks for stopping by! (: I hope you have a great week too! Yay, I'm glad you'll be taking part in MHAM! What books are you planning on reading? Cait from The Notebook Sisters said she didn't find the portrayal of anxiety very fair in Say What You Will, so I'm a bit sad now. ): But I hope I will like reading it anyway. My boyfriend suffers from depression and anxiety so it's an issue very close to my heart! We should read The Culling... together. Lol idk when I'm gonna find the time to read it. Maybe July? Sad to hear you're meh about These Gentle Wounds so far! ): And lol, I didn't even notice how strange the cover model's hair was till now. What things have you heard that weren't so good about the witches in Half Bad? I haven't really read that many reviews, just glanced at the Goodreads page briefly. I'm going to be reading Ultraviolet by R. J. Anderson, Unravel by Celia Read, Wild Awake by Hilary T. Smith, and OCD Love Story by Corey Ann Haydu. I'm not sure how mental illness plays into Ultraviolet or Unravel (both are psychological mysteries) BUT I AM EXCITED FOR ALL THESE BOOKS! And Unravel will be my first New Adult book in a long, long while, too (NA generally doesn't interest me but this one seems different). Aw, I'm a little sad now, too... Hopefully I will be able to enjoy it still also. And I hope your boyfriend is doing all right :D Yesss! 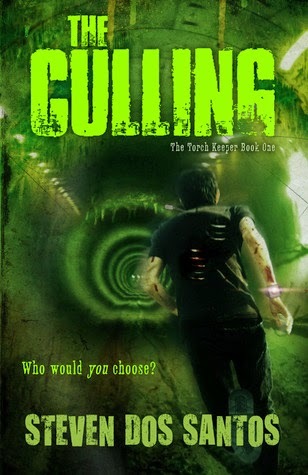 Let's have a The Culling readalong sometime-- I don't mind waiting for you! And I am proud about being the person who made you realize the strangeness of Cover Model's hair (sorry, Cover Model but it is true). Well, I've heard that there isn't much magic-using or any good building of the history of the witches. Also, apparently the whole Black vs White witch thing has been found to be disturbing by some reviewers. Although, I do know that it's just how you interpret the set-up... I'm just a little worried, is all. I'll probably still read it someday because NATHAN! Oooh, OCD Love Story by Corey Ann Haydu! I really wanna read that one, but I think I might wait for the paperback to come out in August... Idk though, I'll see how the month goes. I haven't really heard about any of the other ones on your list! o: I will be sure to check them out, and I'm interested to hear what you'll think of them! I have never read any NA, haha. I tried to read The Gravity Between Us because I thought an f/f NA might be a good place to start, for me, but that book and I just did not click. So much of NA looks a bit dubious to me, but maybe I just don't know where to start. So I'll love to hear what you'll think of Unravel if it seems a bit different! YES. Let's do this in July... Uh, what time zone are you in? I just realised I have literally no idea what part of the world you're from. Yeah, I first thought that paperback was available and so was a bit disappointed to find it wasn't! Oh, well, I don't mind paying a little extra money (that is, until I run out of the green stuff). Anyways. I'm reading Unravel right now and it has started off really well! Very mysterious, weird, intriguing, and making my brain make up theories every five chapters. I've read two NA books in the past and I didn't like them at all. I didn't try to read more after that because all the NA titles looked like they were about the same things (contemporary romances about damaged people and blah blah blah), and the hating of girls other than the MC seems very popular, which makes me mad. And then I saw a positive review of Unravel from a trusted reviewer who usually gives negative reviews to NA books, so I thought to try it out. Aw, well, I am glad that you are supportive of him :) I don't really know much about anxiety (or about anything that has to do with mental health... Which is why I am participating in MHAM, to learn more! ), but I know that it can be very hard to deal with. I believe that I am in the Central time zone! I'm right in the middle of the US. You live in England, right? You seem very English to me (and because, uh, I read your about page, but whatever). So excited for this! You will have to put up with my awkwardness with fancy names, though seriously, Lucian and Digory! Diiii-goooo-reee. And Lucian reminds me of the game Lucius, which featured a creepy demon child. So. Hey, Lucian! I look forward to hearing your thoughts about Half Bad! I hope that the book isn't... Half bad... Sorry, I couldn't help myself. I can think of only one book about depression that might not have a suicidal plot, but I've not read it; A Note on Madness by Tabitha Suzuma. Otherwise, I don't know. I kind of want to steer clear of depression generally, for the month. I get really emotionally involved in the books I read, and they really bring me down. I couldn't handle several books on depression in one month. I'm currently reading Amy and Matthew by Cammie McGovern. I'm also planning on reading Breaking Butterflies by M. Anjelais and Forgive Me, Leonard Peacock by Matthew Quick. I looked at some other lists, and a few books I have seem to fit, though I'm not sure how yet; Looking for Alaska by John Green; Just Listen by Sarah Dessen, and If You Find Me by Emily Murdoch. According to MentalHealth.org.uk, Torettes Syndrome falls under mental health, so I'm thinking of including When Mr Dogs Fight by Brian Conaghan, and also considering The Curious Incident of the Dog in the Nightime by Mark Haddon as the site also says that Autism comes under mental health, but I'm not too sure about them both. And I have Speak by Laurie Halse Anderson, if I can bring myself to read it. Yeah, NA books do all look the same. And they have such off-putting covers too most of the time. ): And some of them just sound like thinly-veiled erotica. And I agree, girl-hate makes me so sad. D: D: I hope Unravel keeps being awesome. It can get pretty hard for me sometimes, but I try not to complain because it must be a lot harder for him actually having to go through what he does! Still, it's really depressing having to watch him hurt when I love him so much. I'm really hoping some of the books I read in MHAM June can capture my side of the experience too. I'm in Hong Kong in July. :D Hopefully we can find some time that works for both of us. Don't know when I'll ever get round to reading Half Bad, haha. My TBR list is starting to look like a mess. God, two months ago before I started book blogging, I didn't even HAVE a TBR list, and now it's already got completely out of hand. I've read A Note of Madness! I read it years ago, when I was around 13 or 14. Don't remember what happens, but I did like it a lot. I'm actually planning to read the sequel (A voice in the Distance) for MHAM, and that one does have a suicidal plot, I think. I know I said I don't want to read suicide books, but I'm making an exception for this one since it just seems like a good opportunity to return to a story I liked when I was younger. I'm trying to find books that I can identify with (books with a character who is/falls in love with another character who is depressed and/or anxious). Amy & Matthew seemed like it might fit the bill. And These Gentle Wounds kind of does too I think. Dr Bird's Advice is actually a more hopeful story, I think-- a depression book but not a suicide book, as far as I know. I'm also reading Crazy by Amy Reed and I Don't Want to be Crazy by Samantha Schutz. I'm pretty sure I've read Just Listen and I've definitely read Looking for Alaska but my book memory is appalling and I have no idea how they fit either. I'm looking forward to your reviews!